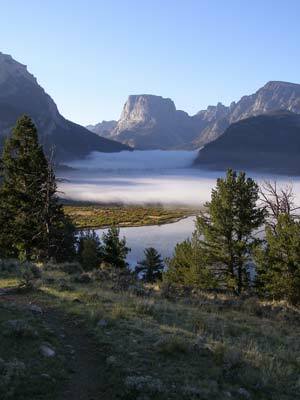 We are located in Pinedale, Wyoming, at the foot of the beautiful Wind River Mountains. This small community is the American West's "best kept secret," offering small town character with steady growth. Welcome to The Barn Door, where good design knows no boundaries. Wendy C. Walter and Mary Lynn Mickelson, interior designers with over 35 years of combined experience, have been partners at The Barn Door since 2000. Ventures covering every possible design application from redesigning old mountain cabins to newly constructed contemporary commercial buildings have brought them success in all venues. The Barn Door's design studio includes an extensive resource library covering all aspects of interior design. Wendy and M. L. draw upon these sources when compiling possibilities for any project, large or small. Every design meets their strict requirements: visual appeal, comfort and client satisfaction. If you have a current or upcoming project and need assistance, we would enjoy discussing it with you. Please call to schedule a consultation. Wendy grew up in Atlanta, Georgia and graduated from the University of Georgia in 1986 with a Bachelor of Science in Home Economics and a major in Interior Design. She interned her last semester with Ethan Allen Carriage House and then went to work for an independent designer, Windsor Interiors. One year later she joined Chelsea Interiors and was president for 4 years. After moving out West in 1990, the concept of The Barn Door was born. Shortly before The Barn Door opened for business, Wendy and Mary Lynn met, decided to combine their talents and vast array of sources and the two have been together since ... enjoying all the people they meet and the challenges that come with them. Mary Lynn was born in Afton, Wyoming, but at a young age moved to Salt Lake City, Utah where she grew up, completed her education, married and began a family. She has been the owner of several independent businesses all relating to the world of design. One business in particular, Interior Plant Design of Salt Lake, was responsible for creating and installing the largest interior landscape in the western United States during the early 80s. This design was completed for the new office complex of Northwest Pipeline, now known as Williams Brothers. Before meeting Wendy and becoming involved with The Barn Door Design and Interiors, M. L. worked under the name MLM Design, offering interior design services, color consultations and exterior landscape design. She maintains that every budget, large or small, deserves the necessary time and attention to create a great design.